Yesterday we reported about the leaked high quality live images of Huawei's upcoming Mate 20 Pro which showcased the smartphone in a Black color variant revealing its front and back panel (here). 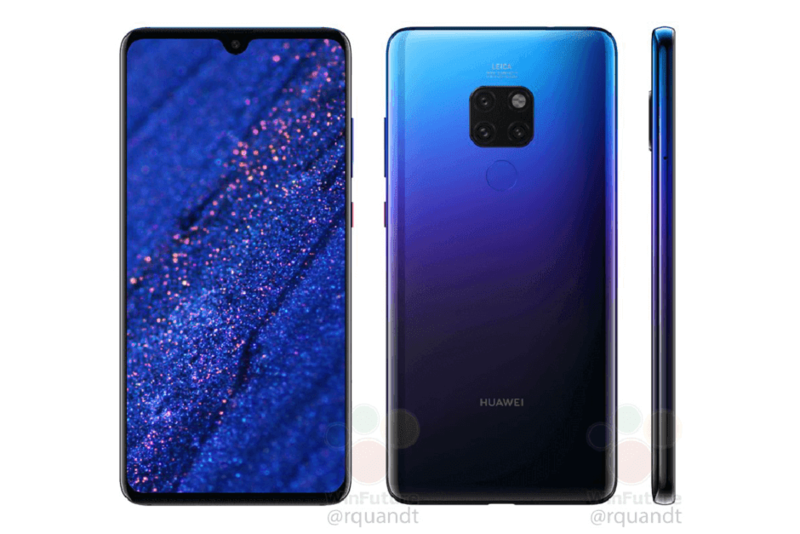 Now today the popular leakster Roland Quandt has published the render images of the regular Mate 20 revealing its front and back panel in an unique Twilight color. Unlike the premium Mate 20 Pro the regular Mate 20 will feature waterdrop notch display with narrow side bezels and slightly thick bottom bezel, whereas Mate 20 Pro has a notched display design. We can also spot the volume rockers and power button on the right hand side. The rear panel of the smartphone seems to be having a square shaped triple-camera sensors accompanied by LED flash placed on the middle, and we can also see rear-mounted fingerprint scanner which indicate that the Mate 20 won't feature an in-display fingerprint sensor. Recent rumors revealed that the Mate 20 will feature a 6.43-inch TFT LCD display with resolution of 2244 x 1080 pixels. The device would be powered by the company’s own Kirin 980 (7nm octa-core) processor and may be coupled with three options of RAM like 4GB, 6GB, 8GB, while there will be different internal storage options like 64GB, 128GB, 256GB, and 512GB that may varying based on the region. The device will run on Android 8.1 Oreo out of the box with the company’s own EMUI 8.2 on top and will pack a 4,000mAh battery with support for fast charging technology. Huawei Mate 20 is expected to be available in three color options like Black, Blue, and Twilight, and according to the recently released promo material the Mate 20 will be priced around NIS 3,000 (~$840 US dollar) and Mate 20 Pro may have a price tag of NIS 4,000 (~$1,115 US dollar) in Israel.